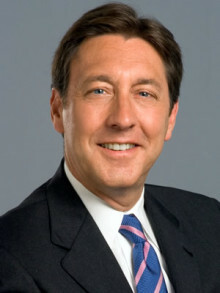 An ESPN and cable industry pioneer, George Bodenheimer, was named ESPN’s fifth president in 1998, and as the company’s longest-tenured top executive has led an unprecedented period of growth for ESPN. Bodenheimer’s path to leadership mirrors that of ESPN itself—with his sharp focus on creativity and cutting-edge innovation, his emphasis on always enhancing value for ESPN’s fans and business partners and his conviction for teamwork. In 2003, he was also appointed president of ABC Sports, overseeing all the multimedia sports assets of The Walt Disney Company, and in 2004 he assumed the role of co-chairman, Disney Media Networks, encompassing strategic planning for Disney’s media assets. As president of ESPN, Inc., Bodenheimer leads one of the world’s premier brands with over 50 business entities and counting—including six domestic television networks (ESPN, ESPN2, ESPN Classic, ESPNEWS, ESPN Deportes, ESPNU); 46 international television networks; ESPN, ESPN2, ESPNEWS and ESPNU HD (simulcast services in high-definition); ESPN 3D; ESPN Regional Television; ESPN.com; ESPN Radio; ESPN The Magazine and books; and other growing new businesses including ESPN3.com (broadband), ESPN Mobile (wireless), ESPN on Demand and ESPN Interactive. Under Bodenheimer’s leadership, ESPN offers more leading platforms than any other media entity and has acquired a collection of rights unparalleled in scope. Recent major acquisitions including The Masters, the SEC and ACC, the BCS, Premier League, golf’s British Open and tennis’s US Open were added to the stable highlighted by Monday Night Football, NBA, MLB, college football and basketball, World Cup Soccer and Wimbledon. The number of recent agreements and the unprecedented length underscore Bodenheimer’s focus on ESPN’s mission to serve sports fans. As president of ABC Sports, he oversees one of the broadcast industry’s most comprehensive sports programming schedules, which is now branded ESPN on ABC. Among the premier programming is the NBA Finals, NASCAR, college football including the Rose Bowl, college basketball, World Cup Soccer, the Belmont Stakes, Little League World Series, the Indy 500 and more. Bodenheimer’s vision has led to numerous company and industry-leading innovations in integrated sales and marketing, original programming, rights and business acquisitions and new technologies, highlighted by ESPN’s state-of-the-art Digital Center in Bristol, a West Coast production facility in Los Angeles, an Innovation Lab in Orlando and, in conjunction with Disney, a Media and Ad Lab in Austin. He established an organizational structure with leaders focusing on six areas: content across all media, technology, international, sales and marketing, finance and administration. In 2010, he was named to the Vanity Fair 100, Vanity Fair magazine’s list of the most influential people in the world. Do you want to hire George Bodenheimer? Directly request a quote. In 48 hours we can send you the availability of George Bodenheimer If you would like to book George Bodenheimer, Entertainment Booking Agency is the right place. We will offer you the best price and contact the management or we directly contact George Bodenheimer. For corporate appearances or speaking engagements you can contact our agents and the will help you true the process. Tags: hire George Bodenheimer, George Bodenheimer booking, book George Bodenheimer, George Bodenheimer appearances, find more information on booking George Bodenheimer for appearances, George Bodenheimer speaking engagements, George Bodenheimer endorsements/spokesperson, George Bodenheimer appearance fees, George Bodenheimer booking agency contact info, biography of George Bodenheimer, Contact an artist booking talent agent find a speakers bureau that can book George Bodenheimer, speaker booking agency for George Bodenheimer, George Bodenheimer booking agency, George Bodenheimer booking for corporate event. EBA is one of the biggest entertainment booking agencies in the World. We book hundreds of celebrities, artist, athletes and speakers in a year. Important to know is that we are not claiming to be the management of George Bodenheimer. We are not the official agent for George Bodenheimer. Companies from around the globe book these artists and speakers true our company be course we have one of the biggest networks and we always have direct contact with the artist or the management. We help you to find the right celebrities for your corporate of private events. Please contact one of our agents to get free advice and we will help to get the world-famous artist on your party.